I read two books a while ago for my book club which were too good not to share. With both I found myself immersed in the worlds created, I loved the characters and didn’t want the stories to end! Jojo moyes is the author of the well-known book and now movie „Me before you“. I enjoyed her writing and decided to try another one of her books, entitled “The Last Letter from your Lover”. This novel mainly tells two stories. One set in the 1960s and centres around Jennifer Stirling, a wealthy married woman who wakes up after an accident having lost her memory and tries to put the missing pieces of her life back together when she discovers some old correspondence from a mysterious lover. In 2003 Ellie, a young journalist stumbles across these old now lost love letters and the two women’s lives intertwine. The book was well written and tells of an amazing love affair. Of course things are never simple and there were lots of clever unexpected and unpredictable twists. Overall I found it a satisfying read which I personally preferred to “Me before you”. I've since ordered another of her novels, "The Ship of Brides", which also has an interesting premise and is set in the past. The second book I devoured in just a few days was “The Guernsey Literary and Potato Peel Pie Society” by Mary Ann Shaffer & Annie Barrows. It centres around Juliet Ashton a writer in post World War two London who begins a correspondence with someone in Guernsey which had been under German Occupation during the war. The book is told through a series of letters back and forth between various characters which initially I found quite unusual but as I got more into the story, the letter style suited it perfectly. All the characters in the book really come to life and I loved being transported back in time before the art of letter writing has mainly fallen to the wayside. Books don't often make me cry but I did shed a fear tears at a particularly sad moment. Reading some of the stories about the war, the sort of things that did actually happen, was hard. Overall an interesting and heart-warming read. Let me know if you read either books and what you thought if you did! Or if you can recommend anything else. 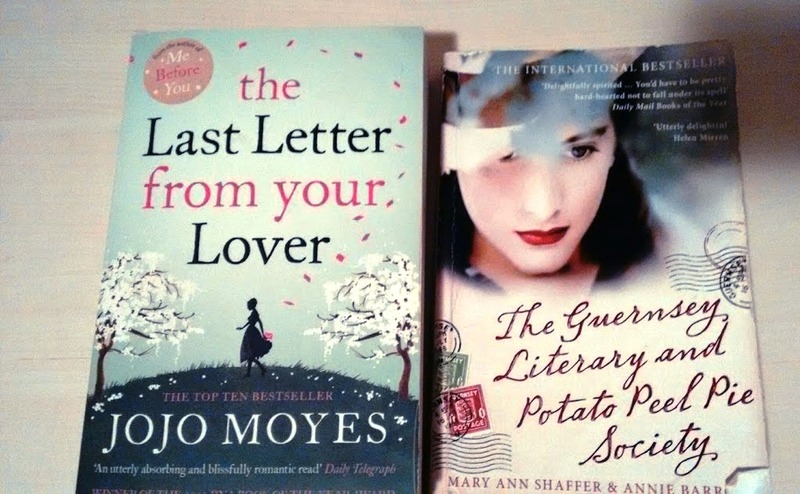 I haven't read either of those but I did love JoJo Moyes's book Me Before You. I'd definitely give this one a go. My aunt raves about the The Guernsey Literary and Potato Peel Pie Society - the name puts me off, though, it sounds too quirky for me.. (I'm not great with quirky, whimsical or magical). Now I've had two recommendations, I'll get it off her and give it a try. It seems like ages since I read a great book. Oh, I loved Guernsey! The JoJo Moyes sounds good, too. I liked Me Before You but then didn't really like Me After You as much. This one sounds so interesting. I second State of Wonder! How funny, I read a book over the summer that's YA and it's also titled This Is How It Ends but it's by Marieke Njiekamp and is a school shooting book told by multiple perspectives and REALLY well done. Other recent favorites: Tell The Wolves I'm Home by Carla Rifka Brunt, All The Bright Places by Jennifer Niven, Station Eleven by Emily St Johns Mandel, My Grandmother Asked Me to Tell You She's Sorry by Frederik Backman. Jodi Picoult wrote a book about a school shooting too, called Nineteen minutes. Read it ages ago but remember it was quite cleverly written from different perspectives as well. I haven't heard of those authors, but I'm looking forward to looking up your recomendations and deciding which ones to add to my reading list! The Last Letter from your Lover is on my list! i just requested it from the library so i hope i get it soon. The Guernsey Literary and Potato Peel Pie Society is one of my favourites of ALL time. i put it off for ages, that title is so weird, right? but i have read it several times since i first discovered it like... 8 or so years ago? so good. You'll enjoy Last letter from your lover I'd say, I found it hard to put down once I got into the story. Yea I know what you mean about the The Guernsey Literary and Potato Peel Pie Society title! Someone recommended it to me and said they thought I'd like it. Just as well I didn't only judge it by its cover as it's such a unique and lovely book! I loved the Guernsey Literary and Potato Peel Pie Society! Such a sweet book. I will have to check out the JoJo Moyes one! I think everyone at my book club loved the Guernsey Literary and Potato Peel Pie Society, very heartwarming and sweet. The JoJo Moyes ones is worth checking out, hope you also enjoy it. I loved The Guernsey Literary and Potato Peel Pie Society! Have you heard of a book called Ella Minnow Pea? It's also written in letter form, but as the story goes on more and more letters (as in of the alphabet) are "forbidden" so the spellings and word choices get interesting! No I haven't heard of that. Sounds interesting though! I guess you get used to reading the words with the missing letters after awhile. Have you read "room"? It's written from the perspective of a child so it took awhile to get used to the way they spoke. Was also an interesting idea. I have read Room. I loved it, although it made me cry. The Naples series (4 books starting with My Brilliant Friend) by Elena Ferrante. (Not great fun, but a great series). I've reviewed a couple of books by Sarah-Kate Lynch on my blog. They're light and funny but she has excellent insight too. Highly recommend any of her books - she is a NZ writer but sets them in London or Ireland or New York etc. Alan Bradley writes the Flavia de Luce series. Loribeth at Road Less Travelled is a huge fan and put me on to them.